Conveyancing is the legal process associated with residential property – buying/selling/gifting/transferring on separation or divorce and remortgaging. At Tinsdills we try not to just treat this as a process and consider the journey of the people behind the conveyancing transaction. A conveyancer is anyone who does the conveyancing – this can be a partner down to an unqualified clerk – clients need to ask and be told who is dealing with their matter and that conveyancers level of experience. All conveyancing clients will have a bespoke estimate of costs which will be confirmed in terms of business once we are instructed. 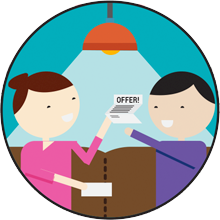 See a Breakdown of Conveyancing Fees or Get a Conveyancing Quote. How long does the process of buying or selling a house take? All transactions are different and can take longer. How long the Conveyancing Process takes will depend if there is a chain or if the transaction is for example leasehold. That’s why it’s important to get bespoke advice from a qualified professional who doesn’t lose sight of the “human story” behind the documents that they are dealing with. What is exchange of contracts? How are contracts exchanged? Solicitors exchange contracts over the telephone using a formula set down by the Law Society. What is a completion date and what does completion mean? 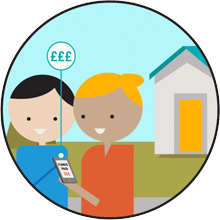 Completion is the day that the money in to buy the house is forwarded by bank transfer by the buyers solicitor to the sellers solicitor and the keys to the property are released. How long does it take between exchange and completion? There isn’t a set time between exchange and completion however a simultaneous exchange and completion is not advised. If possible, an average of one week is ideal between exchange and completion however this is not always possible. I have my mortgage offer, what’s next? When buying a property if all other details are complete then once the mortgage offer is received it needs to be reviewed to ensure that there are no conditions which can’t be complied with. If that is the case then we proceed to draft a purchase report and forward this to the client with a financial completion statement if appropriate. This is usually within a few days of receipt of the mortgage offer. The client then signs the contract. How long between getting my mortgage offer and completion? Usually lenders will insist on 5 -7 working days for drawdown of funds so if a transaction is ready to proceed after the client has signed the contract then it’s usually a week to ten days to completion if this timescale can be agreed between the parties. What happens to my current mortgage when I move home? If you move house you may be able to “port” the mortgage product to the new property but the mortgages will need to be legally repaid and released from the old property and secured on the new property.